A robotic arm on the International Space Station (ISS) has grabbed and attached the Dragon supply vessel. The arm pulled the ship into a free berthing port on the underside of the orbiting platform. Dragon has been built by the California firm SpaceX and is carrying half a tonne of food and other stores for the ISS astronauts. It is the first time a private sector company has delivered freight to the station. The high-flying laboratory’s Canadarm2 was controlled by US spaceman Don Petit from inside the ISS. He grabbed the capsule at 13:56 GMT (14:56 BST). "Houston, looks like we got us a Dragon by the tail," he radioed to Nasa mission Control in Texas. The capture was met by applause from controllers, at the Nasa centre and at the SpaceX HQ in Hawthorne, California, where Dragon’s flight is also being overseen. Just under two hours later, Petit used the arm to position the Dragon under the ISS’s Harmony connecting node. A good seal was confirmed at 16:02 GMT (17:02 BST). The ISS crew will go inside the ship on Saturday to unload its stores. The attachment of Dragon to the platform marks a significant milestone in the history of human spaceflight. Traditionally this field of endeavour has been the preserve of government-owned and operated vehicles. But the US space agency (Nasa) is is looking to save money that it can then re-invest in some of its other programmes far beyond Earth, at asteroids and at Mars. It belives this can be achieved by contracting out the more routine tasks in low-Earth orbit to the private sector. To that end, it is providing seed funding of approximately $800m to SpaceX and another company, Orbital Sciences Corporation, to help them develop new rocket and cargo vehicles. Orbital’s rocket is called Antares, and its freighter is known as Cygnus. The pair should go into space together for the first time before the end of the year. Once these companies have proved the performance of their systems, they will start to receive lucrative ISS re-supply payments. 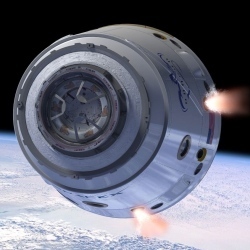 For SpaceX, its contract is valued at $1.6bn (£1bn) and calls for a minimum of 12 Dragon cargo missions to the ISS. But freight is just the start. The ferrying of crews to and from the ISS will be the next service Nasa buys in.